There were many things I wanted to become while I was growing up and it kept on changing with what inspired or influenced me. I guess when I was small being a doctor was the most inspiring profession than all. But when the time came for me to really choose a path, everything was interesting. What motivated you to become an anaesthetist? While doing internship I had a rare chance of working in the oncology department for two weeks. There I witnessed a patient in severe pain, with carcinoma gall bladder which is a terminal illness. She was a 22 year old mother of two with a loving husband. She was admitted in the ward for pain management and was not getting relief with any medicine. Then they consulted an anaesthetist for an intervention for pain management and the patient had instant relief and could play with her kids till her last breath. This motivated me to become an anaesthetist. What do you do at a typical day at the hospital? The place where I work is more of a very busy tertiary centre of excellence which always strives for its service to the poor. I start my work in the operation theatre at nine in the morning. It starts with the coffee, greeting team mates, arranging theatre, greeting patients, reassuring them of their safety at our hands, conducting anaesthesia, waking up of patients, accompanying them to recovery room, sign over to recovery nurse, reassurance to family, shifting to next patient. I do this three or four times in a day, and yes there’s troubleshooting now and then but how I can change the physiology of a person and make them unaware of their surroundings is still an awe to me. What is the most memorable incident (a patient, or a challenge) that happened to you at the hospital this week? This week I was posted in orthopaedic surgery list paediatric unit. Some how most of my cases were boys ages ranging from 6-12 years old. They were all small time, big time buddies from the ward where they had been admitted. So when I went to receive one of them early in the morning I found three of them sitting together in one bed under a single blanket. I asked which one of them would like to go first? They all stopped their mischievous activities and became extremely quiet. So I asked them again. Which one among them was the bravest to go first to the theatre? Still no answer. Just then a small girl was wheeled in for some surgery in some other theatre. So I just said a bit loudly ,” well then if no one among you is brave enough to undergo surgery we will all just go home.” At that point the smallest of the three stepped in to say that he wanted to go first. He made a brief frown on inserting a cannula and when it was all done, turned towards his friends to tell them its not so painful. And turned towards the girl and smiled. I was very amused to see this kind of behaviour demonstrated by such small kids. It took a lot of courage and effort for him to overcome his fear and to impress the little girl, it was very heartwarming. He surely made my life easy that day. 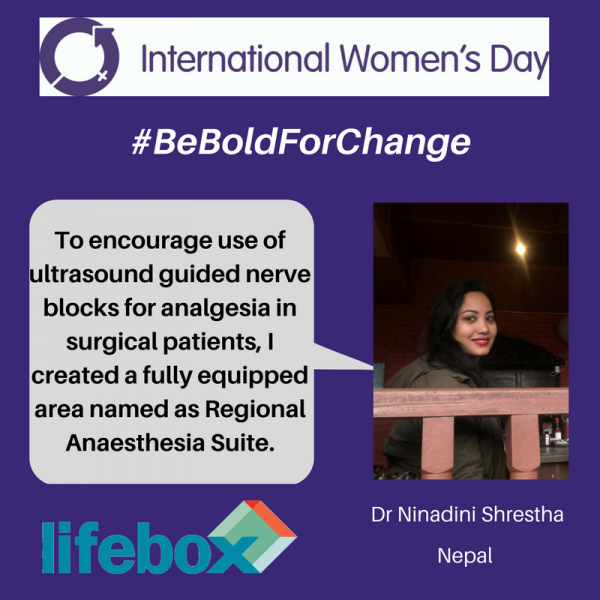 The theme for IWD this year is “ Be Bold For Change”, how have you been bold for safer surgery/ anaesthesia? For safer surgery/anaesthesia I have been persistent on use of ultrasound for various aspects of anaesthesia. From confirming of endotracheal intubation to inserting central lines to giving blocks, ultrasound has really revolutionised our anaesthesia practice by making it much safer for the patients. To encourage use of ultrasound guided nerve blocks for analgesia in surgical patients I created a fully equipped area named as Regional Anaesthesia Suite. It is a small space but has the required equipment, drugs and most importantly an ambience that encourages use of regional anaesthesia for better pain management in surgical patients. We could do this all in one day and all that we needed was an idea that worked. So that’s how we were bold for change. Why is surgery and anaesthesia important for women’s health? There are many kind of illnesses in the women’s health that require surgery and anaesthesia. Depending on the type of surgery, the type of anaesthesia is also tailored. So in case the surgery is mandatory, it can not only be curative but life saving. However there are some risks involved with any kind of surgery and anaesthesia. Safer anaesthetic technique makes surgery very safe these days and hence has an impact on indicators of women’s health.